Singer-songwriter Bill Santen (aka Birddog) doesn't pull any punches on his latest, A Sweet and Bitter Fancy, which includes guest performances by Elliott Smith and Edith Frost. Elliott Smith plays drums, piano, and bass on "Third and South," a jangly, Beatles-esque lo-fi pop song worthy of Smith's involvement. Edith Frost delivers the backing vocals for "Rattlesnakes," a country-tingled number sure to get you sipping a few beers while you sit and take it all in. The rest of the album is a cocktail of lo-fi, whispery pop, back porch country, and jangly, layered pop songs, at times intertwining country or southern influences, while other times relying solely on AM radio pop as the inspiration. 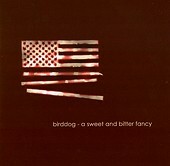 A grand collection of poetic masterpieces, Birddog has no problem writing memorable, filling songs no matter what the style. Whether he beefs up the production and instrumentation or keeps it simple and grounded, he always hits the bulls eye. I'll give this an A.